Tuesday • November 17 • 2015 Volume 82• Number 45 bp Broadcaster Press INSIDE: n Bomgaars n Sears	Presorted Standard US Postage Paid Permit #8 ECRWSS Vermillion, SD n Menards n Employment	Postal Patron Local Since 1934 201 W. Cherry n Vermillion, SD 57069 n Phone: 605-624-4429 n Fax: 605-624-2696 n www.broadcasteronline.com From our house to yours, Vermillion Happy Thanksgiving We’ll Cook, You Host! Traditional Turkey Dinner Start a new tradition this holiday season and let Hy-Vee help. Happy Hearts (and stomachs!) are guaranteed with this traditional 10-12 lb. Butterball turkey dinner. Serves 8, includes 16 oz. of turkey gravy, 12 jumbo honey butterflake dinner rolls (white or wheat) and three sides of your choice. Closing at 2:00 pm on Thanksgiving Day, Nov. 26th Reopen at 6:00 am on Friday, Nov. 27th Traditional Boneless Ham Dinner With Hy-Vee’s Farmland boneless ham (5-6 lbs. ), your holiday meal just became as easy as slice and serve. Serves 8, includes 16 oz. of turkey gravy, 12 jumbo honey butterflake dinner rolls (white or wheat) and three sides of your choice. Your Choice $80 Take the hassle out of the holidays! 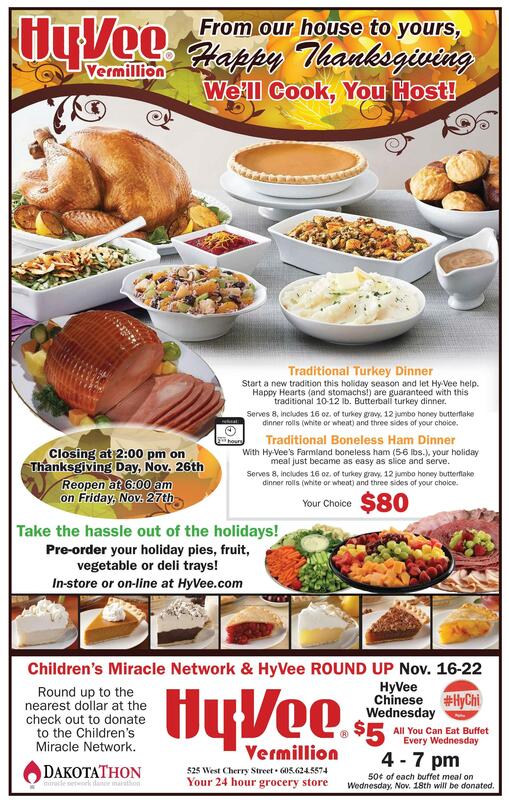 Pre-order your holiday pies, fruit, vegetable or deli trays! In-store or on-line at HyVee.com Children’s Miracle Network & HyVee ROUND UP Nov. 16-22 Round up to the nearest dollar at the check out to donate to the Children’s Miracle Network. 5 $ Vermillion 525 West Cherry Street • 605.624.5574 Your 24 hour grocery store Home of Great Ideas since 1934 HyVee Chinese Wednesday 4 - 7 pm 50¢ of each buffet meal on Wednesday, Nov. 18th will be donated. Come See What’s New at Hatch Furniture! Brand New Flooring Showroom Features Carpet, Wood Laminate, Tile & Vinyl All Furniture 50% Off or More! Excluding MSRP & Hot Buy Items 201 W Cherry St. • Vermillion, SD Phone: 624-4429 • Fax: 624-2696 BroadcasterOnline.com All You Can Eat Buffet Every Wednesday hatch FURNITURE Home Design Center Dan Orton, Store Manager and Flooring Specialist, brings 35 years of flooring and furniture experience to Hatch Furniture. 109 East Third, Yankton, SD 57078 • www.hatchfurniture.com 605.665.4416 • 800.798.4663 Monday-Friday 10-6, Saturday 10-5, Closed Sundays, Evenings by Appt.